I opened my eyes to a brilliant morning: sunlight filtering through the trees, birds singing joyfully, and Dani sleeping the deep sleep of the bike tourist. First things first: I stumbled out of the tent and sorted out that full bladder. Getting back in the tent, I debated whether to wake up Dani or let her sleep a while longer while I started breakfast. I checked the time on my phone to see if I could let her sleep more without risking missing the ferry. It was 4:27a. Yep. Turns out we’re quite a bit further north than I’m used to and also coming up on the summer solstice. Lots and lots of daylight. Anyway, since the ferry didn’t leave until 8:00a, I figured Dani could sleep a little longer. Aside: A quick note about point of view. We’re writing this blog together, and we’re still experimenting with the point of view we want to use. It’s strange to use first person when there are two people speaking, but it’s also strange to write about individual thoughts and feelings when writing in third person. We’ll figure it out; bear with us. Dani looking sharp with her visibility vest and helmet mirror. 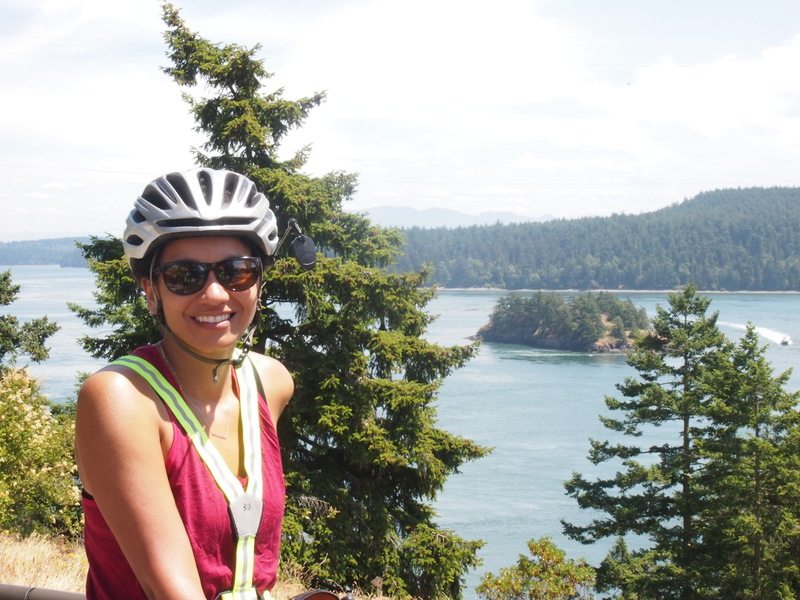 Safety trumps fashion on a bike tour! Day 2, Port Townsend to Sedro-Woolley: 67.0 miles, 2,754 ft. elevation gain, 11.9 mph average speed. Trip: 118.8 miles (59.4 daily average), 5,908 ft. elevation gain, 11.15 overall average speed. Today was a day of several small aches and pains. Feet, butts, knees, hands, and necks all started to complain, “Hey now. We did this long-distance riding thing yesterday. We don’t do this two days in a row.” Thankfully there are no serious hurts. Hopefully our bodies quickly get used to this new lifestyle. We left the campground at Fort Worden State Park around 7:20a and made it to the ferry terminal in time for the 8:00a ferry. The 8:00a ferry that was canceled due to lower than normal tides. So we explored the Fort Townsend city center for a bit. It is an adorable town, but not much is going on at 7:45a on a Monday. The next ferry left at 8:45a, and it was about a 30-minute trip to Coupeville. We met a man named Lou on this trip, a 55-year-old Air Force veteran who retired at the age of 50 and from what we gather, has spent his retirement taking amazing trips like hiking the PCT and now, riding our exact same route as us (including the Great Lakes alternate route), except he’s going all the way to Maine. He’s riding a recumbent bike (a bike that looks like a mesh lounge chair on wheels that can apparently reach 60 mph downhill, but struggles with uphill climbs) and when we saw him roll down State Road 20 after the ferry ride, our feet, butts, knees, hands, and necks all yelled at us for not making a smarter bike choice. He looked like he may as well have been sipping Piña Coladas and reading a book at the beach. Sigh. Anyway, after disembarking the ferry we rode through a combination of farmland and coastal vacation properties for many miles. We stayed on side roads as much as possible, but spent a large chunk of the day on terrible State Road 20, which was heavily trafficked and often did not have a shoulder. This exacerbated our neck and shoulder problems because we tensed up every time a vehicle passed us going 60 mph about 2 feet from our bikes, which happened about 50 percent of the time today. Yesterday, we added tiny rearview mirrors to our helmets. These were great because we could see when the large trucks and rented RVs were about to pass us, but they were also awful, because we could see when the large trucks and rented RVs were about to pass us. 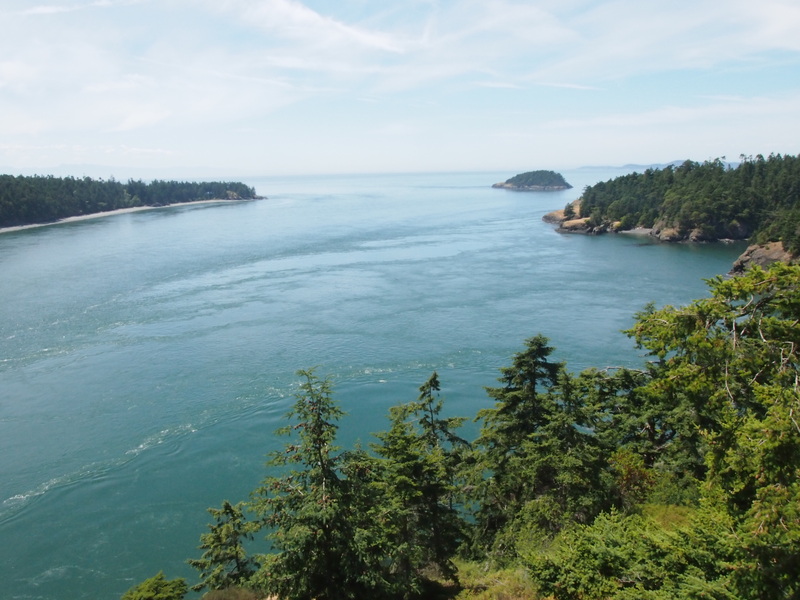 After passing through a couple of town-like areas that were cute, but not particularly notable, we came to the highlight of the day: Deception Pass. For a pass, the climb to the top wasn’t too bad. We didn’t even mind the roadwork on the way. What was a little frustrating was the giant roadwork signs that occupied the entire shoulder, forcing us into the highway traffic lane. Anyways. Deception Pass. 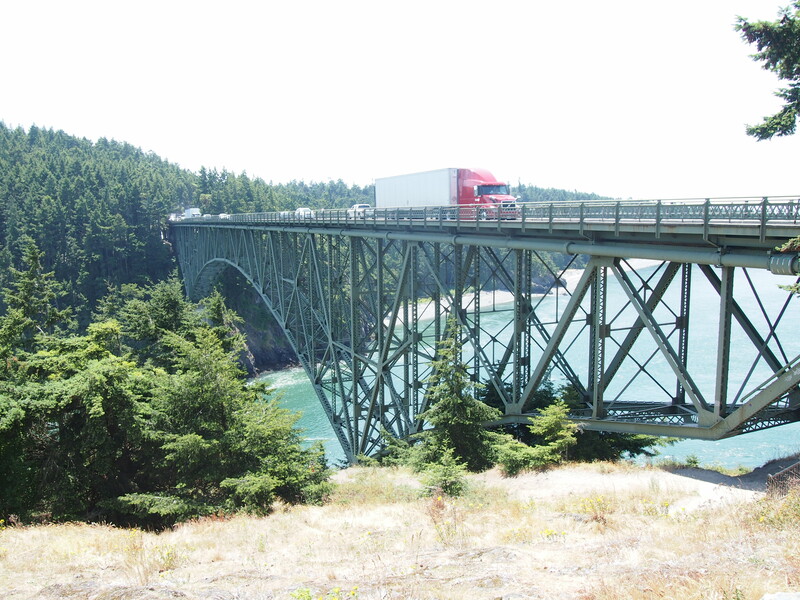 It is a two-span bridge connecting Whidbey and Fildalgo Islands. It has amazing views of mountains and turquoise water. We don’t know how to better describe it, so hopefully our pictures can do it justice. The other most notable aspect of our day was that we made the big right turn to start riding east. We are now officially on the Adventure Cycling Association Northern Tier Route and heading toward home! 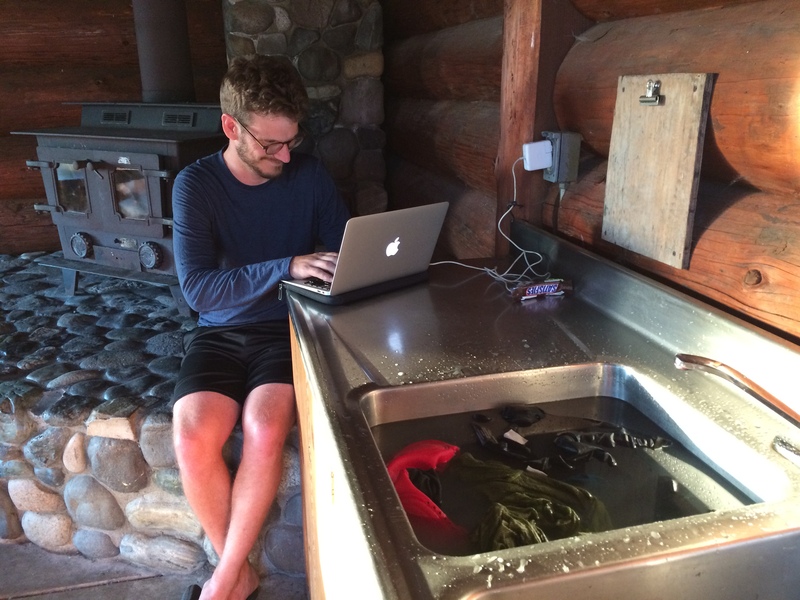 Doing the laundry and writing a blog post at Riverfront Campground in Sedro-Woolley. Breakfast: Farm fresh cheesy scrambled eggs with onions. Yum! Those fresh eggs taste amazing! Lunch: Peanut butter and (blackberry pomegranate) jelly sandwiches, apple, almond/cashew nut mix. Dinner: Don’t judge us. Popeye’s Louisiana Chicken. As we rode through Burlington, WA, we were tired, sore, and hungry. We saw a Popeye’s on the side of the rode on our way to a bike shop, and it was inevitable. We both independently decided to go there for dinner, just like Leibniz and Newton inventing calculus.